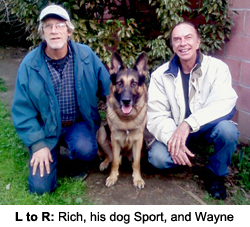 DG Cedar Oil found it's roots when Rich Dressler - Owner and operator of Tacketts Professional Dog Training in Orange, California - had discovered his 2 year old German Shepherd "Sport" had a special sensitivity to fleas. This became a bit more complicated once it was understood that Sport's system did not function well with spot drop flea control products. After some trial with various products and discussions with his colleagues, Rich had determined the best alternative for his situation just might be Cedar Oil. Dr. Ben's Paws & Claws Cedar Oil Flea, Tick and Mite Formula was his product of choice. As he began using the product, Rich was very impressed with the overall benefits of Cedar Oil. He quickly realized that it was much more than just a flea and tick treatment. Then one day the idea that the benefits of Cedar Oil was something that the world had largely forgotten came to life during a conversation with long time friend Wayne Gresham. Also, during that conversation it was realized that a viable business opportunity was presented along with any effort to re-introduce the Cedar Oil concept to the public. Of course DG Cedar Oil had not even been considered on that day, but it was that chance conversation providing the seed for a new business. A loosely created business plan was set in motion that would become a partnership between Rich and Wayne involving the supply, promotion and marketing of Cedar Oil Pest Control products as an alternative to chemical based pest control methods commonly used today. Although our business is still in infancy we are learning quickly and getting the satisfaction derived from selling products that not only work as they should, but do so in a way that is friendly to our environment as well.